As the regular season comes to an end, the Lady Flames (19-10, 15-5 Big South) and their 10 fellow Big South Conference women’s basketball clubs have their sights set on Myrtle Beach and the upcoming Big South Championship tournament. In a year when even top-seeded High Point University (19-9, 16-4 Big South) enters the tournament with four conference losses, the phrase “March Madness” takes on a whole new meaning. Coaches and players are well aware that any team and any seed could take the tournament any game. High Point Head Coach DeUnna Hendrix agreed, admitting that she could see bottom and top seeds swapping spots easily before the tournament’s end. The first round begins Tuesday, March 4 with No. 8 University of North Carolina at Asheville (10-18, 7-13 Big South) matching up against No. 9 Radford (7-21, 5-15 Big South), No. 7 Presbyterian College (11-18, 9-11 Big South) versus No. 10 Longwood (8-20, 5-15 Big South) and No. 6 Coastal Carolina (13-15, 10-10 Big South) taking on No. 11-seeded Charleston Southern University (8-20, 4-16 Big South).The March 6 quarterfinals will feature No. 4 Campbell University (18-10, 13-7 Big South) versus No. 5 Gardner-Webb (15-13, 11-9 Big South) and the first round winners facing High Point, Liberty and No. 3 Winthrop University (20-8, 15-5 Big South), respectively. Semifinals will take place March 8 and the hard-earned championship game will be played March 9. Each team has its own strategy and strengths headed into the tournament. For Liberty’s own Lady Flames, Green said the plan is simple — stick to what has been working late in the regular season. “As we close out, our team is playing well — shooting the ball well, rebounding well — so we seem to be peaking at the right time,” Green said. 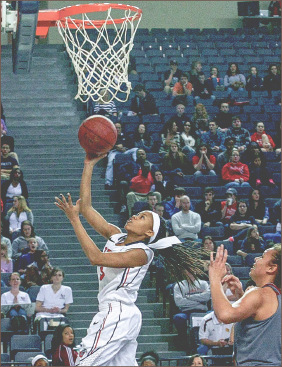 Green also cited Liberty’s depth and bench contribution as a major factor in the Lady Flames favor. Ultimately, both Green and Hendrix agreed that winning it all will come down to heart and toughness.